On Monday the US Government shutdown was averted, and indices continued their upward trajectory, the SPX setting another all-time high. NKY and DAX followed suit enthusiastically, FTSE less so, hampered by sterling’s surprising strength in the continuing absence of bad Brexit news. Conversely, USD continued it’s downward path, with DXY shedding 0.2%., as EUR gained on progress in the German coalition. 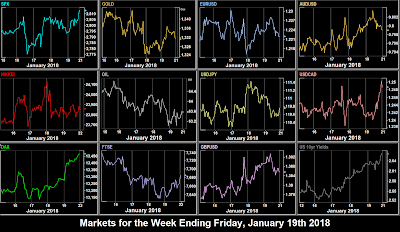 The greenback was down against all currencies except JPY, and Gold was down in line. Oil was up slightly, as was the US 10-year bond yield, which added 2bp after touching 2.672%, the highest rate in three and a half years. After the close, NFLX beat estimates and the stock went up over 10%. Tuesday was relatively flat for indices, although that didn’t stop SPX advancing slightly (0.9%) to post another ATH. NDX was up a healthier 0.51% (to a new high) on the back of the NFLX results. Despite the raft of Germany and Eurozone Sentiment beats, DAX remained flat, as did FTSE and NKY, although the latter made a new intraday high in the Asian session. DXY manage to shed nearly 1%; virtually all other currencies (and Gold) were up, the only laggard being AUD which failed to recover fully from an dip in the Asian session. The BoJ rate decision at 0400 brought brief volatility on both directions, and then JPY continued to appreciate all day. Bond yields followed downward, and Oil was up in line. 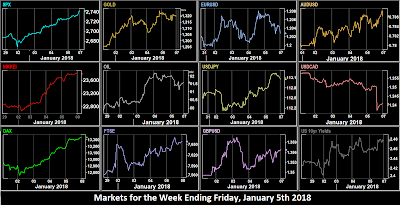 Wednesday was a down day in the Asian session with NKY, and this continued in Europe after PMI misses for Germany (0855) and Eurozone (0900) with DAX and FTSE falling sharply. 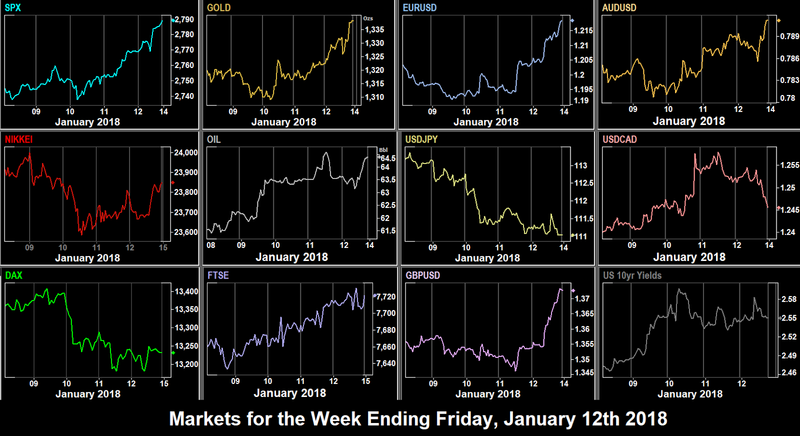 However, despite the risk-off signs of Gold and JPY both up, nothing can stop the US juggernaut, and SPX stayed flat but DJIA eked out another all-time high. TreasSec Mnuchin’s comments about being unconcerned about a weaker dollar continued to drive DXY down another 1%, and all other currencies appreciated substantially, as did Oil. Sterling was particularly strong, up 1.5% above $1.42 for the first time since the Brexit vote. Bonds yields were up 3bp, reversing the previous day’s losses. The minor story on Thursday was another all-time high on SPX and DJIA, but for a third day, minor movement. The pressure on other indices this week is balancing the US (irrational?) exuberance. DAX, NKY and FTSE all fell. This US pricing is all momentum now, the indices barely react to news. The huge surprise of the day was, who else, President Trump at Davos who said at 1900 “the dollar is going to get stronger and stronger and ultimately I want to see a strong dollar”, effectively contradicting his TreasSec's remarks a day before. DXY immediately put on 1% and all currencies (and Gold and Oil) fell against USD for the day. Interestingly, bond yields had preceded the statement, peaking at 2.677% around 1500. After the yields receded, and ended down on the day, not reacting to the Trump remarks. Prior to this, EUR had hit another three-year high of 1.2538 following the hawkish ECB press conference, where President Draghi ascribed the strength of the euro to external factors (ie the collapse of USD), and by implication, was not concerned, unlike last year when the single currency retreated from 1.20 after ECB concerns about the level. 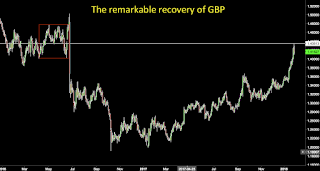 Also GBP touched a new intraday high of 1.4350. Cable is now back in the territory it occupied in H1/2016, when the UK polls predicted a Remain victory, or indeed the price the week before the Brexit vote. The Canadian Retail Sales print was a miss, but hardly any effect was seen. 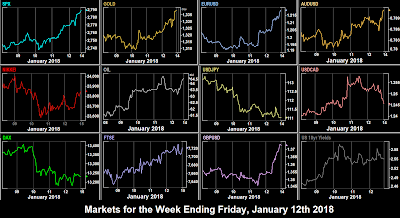 Friday saw something we have seen every week this year (ie three times before) a strong closing rally in SPX and DJIA, and this week all the other indices followed suit. All three US indices ignored the normally significant GDP miss, and posted all-time highs again, with NDX breaching the psychological 7,000 roundpoint for the first time. 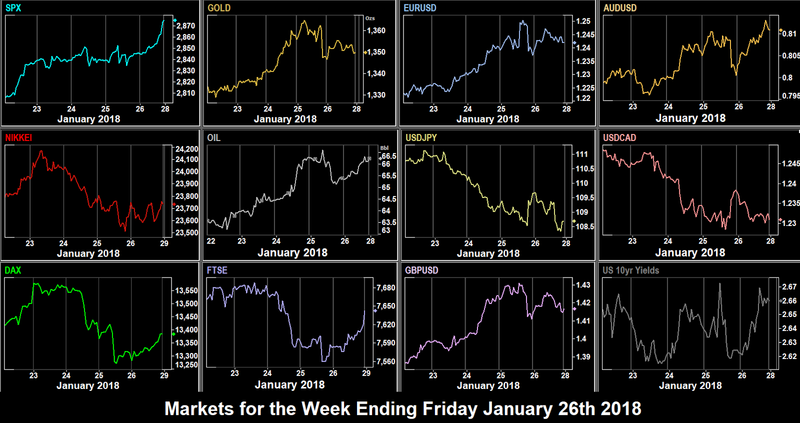 The rally was repeated elsewhere with NKY, DAX and FTSE also up, the latter being particularly strong, posting its best day of 2018, up nearly 1%. The Trump dollar effect was very short-lived, and USD continued to fall, erasing the 1% gain from the previous day. Canada missed on monthly CPI at 1330 causing a brief dip of 0.49%, which was quickly recovered, and all currencies ended up on the day, the standout being AUD (despite Australia being closed) which posted a 1% gain, and touched 0.8135, a level not seen since May 2015. Gold was slightly up, in line, as was Oil, and yields were sharply up (4bp) touching a fresh 9-year high of 2.13%. 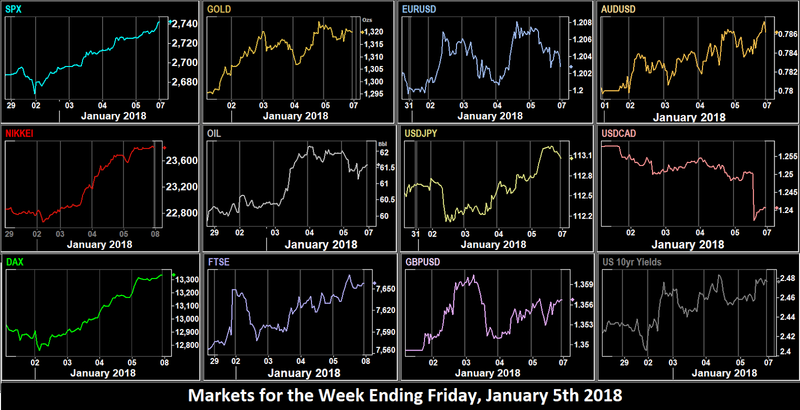 These are the prices movements for the week on the instruments we cover, with USD pulling back for a seventh week, against all currencies, more sharply than in previous weeks. the best forex trade would have been to buy cable, up 2.27%. The top index and overall performer was DAX. At the time of writing, Bitcoin was priced around $11,000, down 4% on the week as the Rodrigue bubble fractal plays out, and volatility reduces. A busy week, with both scheduled and unscheduled news. The Trump Mueller investigation is back in the news, and traders are still pondering Trump’s “stronger dollar” remarks. Speculation about the Fed vice chair position may also feature. And of course it’s US rate decision and NFP in the same week. A press conference is expected on Monday after NAFTA negotiations conclude. CommSec Ross said last week at Davos that he expected “a good chance” of success. China’s National People’s Congress Standing Committee discuss changes to the constitution. The main news of the day is US Personal Consumption Expenditure, an inflation proxy. The main news on Tuesday comes from Europe with German inflation and Eurozone GDP, and BoE Governor Carney speaking to the UK Parliament. President Trump’s State of the Union address is at 2100 after markets close. NZ Finance Minister Robertson speaks at 2130. Wednesday sees Australian and Eurozone inflation prints, but the big news is the FOMC rate decision. The CME Fedwatch consensus is 96.4% for a hold, so no real surprises are expected, but inevitably there will be dollar volatility following the release of the FOMC minutes, and the dot-plot forecast. We will be publishing our fractals as usual. Don’t forget also the ADP Payrolls figure, an indicator to NFP. The estimate (at 180k) is in line with the NFP estimate, so a strong variance may well move the dollar. It ought to move SPX as well, but as you know, the index seems immune to news these days. We also have Canada GDP 15 minutes after ADP, another potential flashpoint for USDCAD. Also speaking today is BoJ Iwata (dove) at 0130. Look for end of month rebalancing signs as the day goes on. We expect high volatility in NQ (NDX futures) after the US bell as FB, and MSFT report (they total 14.66% of NDX by weight). Also reporting is BA, the largest (at 8.88%) component of DJIA. Every 1% move in Boeing causes a 23.6 point move in the Dow. Thursday starts the new month. The calendar for the day is all PMIs, but the only important one is the ISM print at 1500. It separates out prices paid, which is, to an extent, a forward indicator for inflation. Action on the day is more likely to be driven by how traders read the Fed report, and then as the US session progresses, all eyes will again be on NDX and NQ_F in anticipation of heavyweights AAPL, GOOG, AMZN all reporting after the bell. Between them these three make up 28.87% of NDX, so volatility is assured. BABA also reports. Surprisingly, this stock is not in NDX. Friday of course is NFP day. As usual, if the print is close to the estimate, traders will be looking at unemployment and average hourly earnings, which may include the ‘Trump tax Christmas bonuses’ although arguably some of that money may not flow through until February. In recent months, markets have paid less attention to NFP, but who knows, the effect must surely return at some time. Note that Canada’s NFP is non-synchronous this month (ie it is released a week later), depriving us of the volatile USDCAD play. To end the week, SF Fed President Williams speaks at 2030. This week we had the usual all-time highs, but for the first time for a long time, the story of the week was fixed income. There seems no end (a figure of speech, not a prediction!) 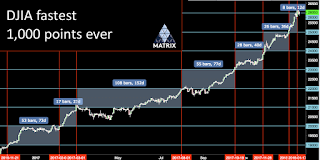 to the equities rally, as on Monday, SPX made another all-time intraday and closing high, and the Euro Stoxx 600 finished just under 400, a price not seen since August 2015, and DAX was up. NKY futures (Japan was closed again) made a new high for this century. Only FTSE failed to join the party, closing slightly down after some GBP appreciation, the only currency to gain against the dollar. EUR was down 0.6%, pulling back from the psychological 1.20 roundpoint, despite beats on the Eurozone sentiment indicators and Retail Sales at 1000. Other currencies were broadly flat, as was Gold. Oil advanced slightly, with, as you can see, no inter market effect. US 10-year Bond yields continued their advance from last week. The big story on Tuesday was not scheduled and from an unexpected corner. The BoJ made a surprise announcement that they were scaling back their monthly bond purchases (QE), which immediately advanced JPY by 0.57%, and by 0.71% during the next 24 hours. NKY fell in line. DAX put in a flat day as EUR continued to fall, and FTSE and GBP had a Turnaround Tuesday, the index recovering Monday’s losses, just as the currency gave up its gains. The BoJ move sparked speculation amongst traders that if conservative Japan was suddenly tapering, then the US might accelerate their tightening programmes and rate hikes. US Bond yields were therefore sharply up by 7bp to a 10-month high. The German Bund and the UK 10-year gilt yields rose 3bp and 4bp respectively, and EURJPY and GBPJPY fell 0.7% and 0.6% respectively, which is more than the USDJPY decline of 0.4%, so the net effect was that USD was up against all currencies except JPY itself. Gold was down in line with the USD position. Oil advanced sharply by 1.5 cents (2.54%) to post a marubozu candlestick. As the strong API stock beat came at 2130, after the pit closes, one can only assume that traders were anticipating it, or possibly it was a consequence of the bullish Japanese outlook. (Japan imports 85% of its energy resources, and is the largest importer in the world after China). None of this affected equities other than NKY. SPX, DJIA, NDX and FTSE all made all time highs, and DAX was up again touching a two-month high. You wait ages for a surprise central bank reduced bond buying announcement from Asia, then two come along at once. At 1030 on Wednesday, the rumor on the wires was that Chinese officials were recommending slowing or halting the buying of US Treasuries. The effect was instant. Yields put 4bp immediately (that’s a 0.41% drop in the bond, the kind of move you get at FOMC or NFP on USD), and DXY dropped 0.52%. Gold shot up as well. Without any official confirmation, the bond price fully recovered, but DXY ended down. This was also do to with rhe fallout from Tuesday’s BoJ announcement. Unlike GBP, JPY did not fade the China spike but carried on rising all day. A great demonstration of the difference between Japan and China. One is tapering their own bonds, the other is tapering USD bonds. The next surprise of the day was a report from Reuters suggesting that Canada was increasingly convinced that President Trump will withdraw from NAFTA. The release, at 19:07 caused an immediate 95 pip drop in CAD, which largely held into the next day. The overall effect for the day was that USD was down against all currencies except GBP. Oil had a very flat day, only moving 2 cents, despite the EIA beat at 1530 (which was less than the API beat the day before). Also we saw the equity advance take a rest, perhaps on the vote of no confidence from China. SPX was flat, NKY was sharply down in line with USDJPY, DAX was similarly sharply down, as EUR stayed up. In a reverse of Monday, FTSE was up as GBP was down on the day. 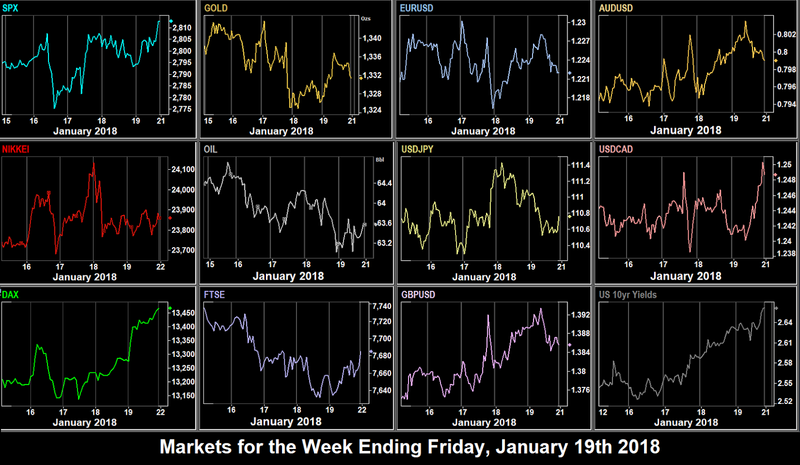 The equity rally resumed in earnest on Thursday, and SPX, DJIA and IXIC (COMPQ, the Nasdaq All-Share, not the Tech 100), and FTSE all touched all-time highs again. DAX fell because of a sharp rise in EUR after the ECB minutes suggested that QE will end in September without any taper, an outcome we highlighted last week. 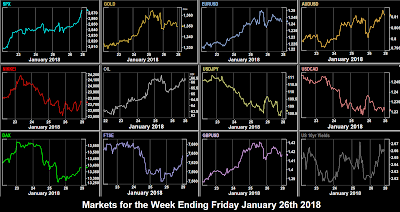 EUR put on 83 pips (0.70%) on the ECB statement, JPY continued up from Tuesday’s BoJ announcement, but in any event, all the other currencies were up, helped by beats on Australia Retail Sales at 0030, Japan Leading Economic Index at 0500, and Eurozone Industrial Production, and a miss on US PPI and Initial Jobless Claims at 1330. China announced that Wednesday’s rumor was ‘fake news’, but this did nothing to help DXY (still falling) or yields (flat on the day). Gold was also up. Oil had a brief rally to $64.77, a three year high, before fading to end the day flat. Friday’s important news was US Retail Sales and inflation, both at 1330. But they both came in as estimated, with only the ‘ex food and energy’ CPI making a the smallest (0.1%) of beats. So it wasn’t important. But anyway, it didn’t matter. Once again SPX, DJIA, IXIC and FTSE all made record intraday and closing highs, and posted near-perfect marubozu candles (the open is the low, the close is the high). We must remember that FTSE is to some extent an oil proxy, so some of these gains come from the strong rally in oil, whether or not GBP moves. Despite the EUR ramp, DAX managed to stay flat, which was a good result in the circumstances. DXY had its worst day since June 27th, and fell 0.96% to finish at 90.90, the lowest for three years. EUR breached $1.22 to hit a three year high as Angela Merkel announced a coalition deal, GBP hit a post-Brexit high amid hopes for a ‘soft’ version. However, this was only part of it as AUD was up 0.29% after dipping on China’s miss on non-CNY imports (the only miss in a raft of beats), and CAD was up 0.51%, in line with Oil, and despite NAFTA concerns and an increased Rig Count (bearish for Oil) at 1800. The weak dollar helped Gold shoot up $16 to a four-month high, continuing the curious dual rally of stocks and Gold. Next Monday is Martin Luther King’s birthday, a holiday in the US. US Futures, and all other markets are open as normal. Bitcoin gave up last week’s gains, and was down 12.78% to finish roughly where it was at Christmas. Monday is Martin Luther King Day, a holiday in the US, although European and Asian markets are open. BoJ Governor Kuroda speaks. Interest in Japan is heightened now they are engaged in a program of tightening. New BoE member Tenreyro (neutral) speaks in London at 1815. Tuesday sees UK inflation, and also the Brexit (EU Withdrawal) bill returns for Report Stage in the UK House of Commons. The CPI estimate of 3.2% would be a new five-and-a-half year record. We also get a rare speech from the Swiss National Bank. Wednesday is the main event, the BoC Rate Decision. A 25bp hike is expected, so expect CAD to move sharply whether we get it or not. The markets have started to price this in following the excellent jobs reports, but NAFTA looms on the horizon. Elsewhere we have Eurozone CPI, not normally a market mover, as the individual countries have already reported, and some speeches:ECB Nowotny (hawkish) at 0855, BoE Saunders (hawkish) at 1145, FOMC Evans (dovish, non-voter at 2000, Mester (hawkish, voter) at 2130. If SPX does not fall below 2705 at the Wednesday close (which is unlikely), it will, at 395 trading days, make the longest run without a 3% drop in history, the most recent and previous record being the 394 day run from Dec 21, 1994 to Jul 12, 1996. The market rose 40.6% in that period. SPX needs to hit 2800 (only 11 handles away) to beat the gain record as well. The main news on Thursday comes in the Asian session with Chinese Retail Sales, and the Australian version of NFP. After a standout print last month of 61.6k, this month’s estimate of 24.9k is moderate, but is still equivalent to 333k in US terms, a figure not seen in the US for years. (The US has 13.4 times the population of Australia). Canada has recently surprised with conservative estimates and then strong beats, and it is interested to see if Australia is going the same way. President Trump will on the stump supporting Republican Rick Saccone in the Mar 13 Pennsylvania election. Trump won this district by over 20% in the election. Bundesbank President Weidmann opens the IMF/Bundesbank joint event on German economic policy, and ECB Coeure speaks there at 1430. Finally, there is the new Canadian ADP report, although as this follows the official jobs report last week rather than preceding it, the effect is very little. The Central Bank of Turkey make a rate decision at 1100. The short week finishes quietly on Friday on the economic release front. However it is once again the US government shutdown deadline. This has been deferred twice. The sticking point is the immigration (DACA and the ‘wall’). However, the Democrats will not want to take the blame, given the proximity of mid-term elections. Watch this space!